I recently had the opportunity to be one of the first in the world to knit a pattern by the fantastic New Zealand knitting pattern designer Belinda Too. Belinda (aka Blendy) is based in Auckland, and has already published a book of original knit sock patterns called Blendy Knits Socks. 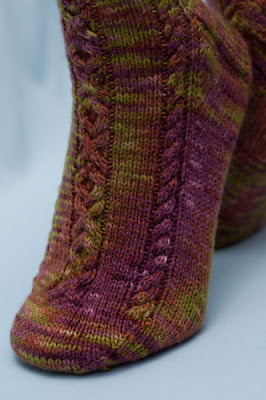 The sock photo below is one of her gorgeous designs. She's now putting together another book, this time with nearly 30 patterns for socks, legwarmers, fingerless gloves, hats, scarves and cardigans. Something for everyone!! I got a sneak-peek, being that I test knit one of the new patterns. How did I get to be a lucky tester? Through the magic of Twitter. I saw the following tweet, and answered the call! A few days later I received my pattern by email. It's all top-secret, so I can't tell you what it was, but I can say I had a great time knitting it. If it's a good representation of the rest of the patterns, I'll have knitting projects lined up for a while once I get a copy of the book. :) Totally cute, wearable, and fun to knit. I sent my finished item up to Belinda last week, and now I'm anxiously awaiting publication. The book is due out in October, and she's planning a book launch in Wellington and Auckland at the end of October.